No one really knows why, but Australia is the undisputed home of ‘big things’ – giant replicas of everything from musical instruments and fruit through to animals and famous figures from history. With more than a hundred scattered throughout the country, we’ve done the hard yards and have discovered 10 of the best. One of Australia’s very first ‘big things’, the Big Banana has become an icon of the Coffs Harbour region. Set within the grounds of a banana plantation, not only are visitors able to learn about the history and farming of the popular fruit, but can also enjoy the assortment of attractions and activities on offer, from a water park and mini golf course through to laser tag, ice skating and more. 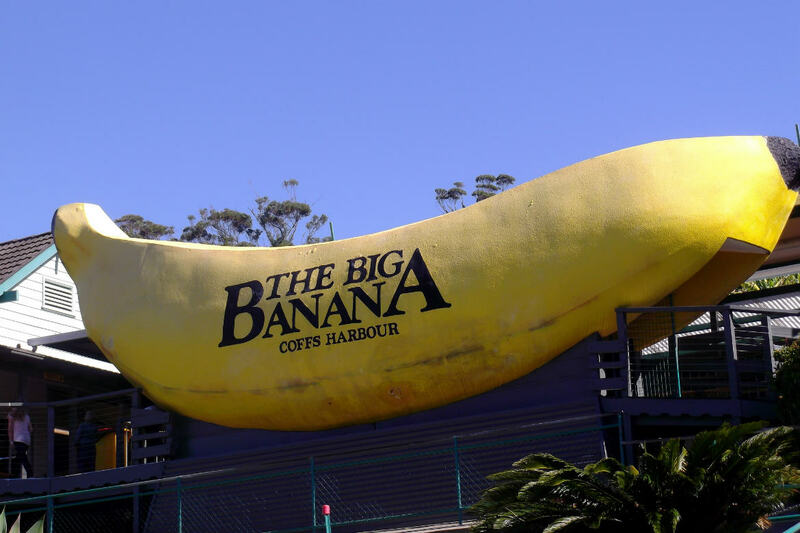 Just a short drive from the heart of Coffs Harbour, a visit to the Big Banana is a great way to keep the whole family entertained. Heritage listed in 2009, Woombye’s Big Pineapple is arguably one of Queensland’s most famous ‘big things’. Found less than half an hour from Maroochydore, the iconic structure stands tall within grounds that are also home to a wildlife park, scenic train rides and a great coffee shop. Learn about the process of pineapple farming, travel through some beautiful scenery or enjoy an animal encounter with some of the wonderful species housed within the Wildlife HQ Zoo. Nicknamed ‘Rambo’ by the town’s residents, Goulburn’s Big Merino stands as a monument to the region’s wool industry. Constructed largely from concrete, the giant ram currently houses a gift shop and exhibitions detailing the long history of wool production in Australia. Learn about how wool is processed and pick up some of the fine Australian merino products in stock, from ugg boots and jumpers to throws and classic sheepskins. A tribute to one of Australia’s most infamous bushrangers, the Big Ned Kelly stands tall in the town of Glenrowan, Victoria. At a towering 6 metres, the fibreglass monument is located just across from Kate’s Cottage, Gifts and Souvenirs, which houses a gift shop and Ned Kelly museum. See the larger than life depiction of the iconic bushranger before touring a replica of the Kelly Homestead and learning more about life at the time. Known as Australia’s country music capital, it’s quite fitting that Tamworth, a regional city in New South Wales, is home to the Big Golden Guitar. A massive 12 metre tall guitar, the Big Golden Guitar sits on the New England Highway, next to the Big Golden Guitar Tourist Centre. Pay a visit to the tourist centre and get to know more about the region and its attractions, before taking a photo next to one of Tamworth’s best known attractions. The home of Bundaberg Brewed Drinks, Queensland’s Big Barrel is more than your average ‘big thing’. Not only does the tourist facility resemble a large wooden barrel, but it is also home to a visitors centre filled with interactive and informative displays that detail the production of the brand’s popular beverages, including its much loved ginger beer and fruity flavour combinations. Try some of the delicious flavours available, find your new favourite soft drink and pick up some merchandise too. Found next to the town’s visitor information centre, Bowen’s Big Mango is much larger than the average piece of fruit. Standing at around 10 metres and weighing in at a hefty 10 tonnes, the massive mango offers the perfect photo opportunity for all fruit lovers. Grab a photo next to the Big Mango, learn about what the region has to offer at the Bowen Visitor Information Centre and enjoy the beautiful coastal scenery that surrounds the delightful Queensland town. Said to be the largest of its kind in the world, the Big Rocking Horse at Gumeracha was constructed in the early 1980s to help attract passing motorists to the wooden toy factory and wildlife park found onsite. Changing hands several times over the years and undergoing work to bring it up to today’s safety standards, the Big Rocking Horse remains an icon of the Adelaide Hills, with visitors able to climb up to the top and enjoy a great view of the surrounding area. One of the largest crustaceans you’re likely to set your eyes upon, Kingston SE’s Big Lobster has been an icon of the small South Australian town for close to 40 years. Positioned alongside the Princes Highway, the fibreglass sculpture was originally designed to attract motorists to the visitors centre and restaurant located on the site, but has grown to become an attraction in its own right. Said to have been designed in feet but mistakenly built in metres, the bright orange statue certainly stands out from the local scenery. Sometimes known as the Big Aboriginal Hunter, the Northern Territory’s Anmatjere Man is an impressive sculpture that overlooks the Aileron Roadhouse and the surrounding region. Created by local artist Mark Egan, the towering figure stands at 17 metres tall and was dreamt up as a way to attract more visitors to the isolated highway road stop. Since its construction almost 15 years ago, the sculpture has been joined by the Anmatjere Woman and Child, another wonderful work of art that pays homage to the region’s Indigenous heritage. Ready to see Australia’s ‘big things’ for yourself? Find cheap flights, great hire cars and more with Webjet today! Feature Image Credit: inchki / CC by 2.0.